Ryan’s Grill, Buffet and Bakery is an American chain of buffet restaurants. It also operates under the name Fire Mountain Grill. The restaurants serve grilled meats and hot vegetables, with a salad bar and a dessert bar. You can find a link to get a Ryan’s application at the bottom. Alvin A. McCall opened the first Ryan’s restaurant in 1977. There are now more than 200 of the restaurants across 23 states. Ovation Brands, which was founded in 1983 by Roe Hatlen and C. Dennis Scott, acquired the chain in 2006. The privately owned company’s CEO is Greg Graber. It has headquarters in Greer, South Carolina, and Egan, Minnesota. Ovation Brands, Inc. also operates Country Buffet, Old Country Buffet, Home Town Buffet, and Tahoe Joe’s Famous Steakhouse restaurants. The eateries serve comfort foods like homemade macaroni and cheese, fried chicken, mashed potatoes and gravy, and home-style soups. Breakfast offerings include eggs, waffles, and pastries. Nutrition information and special dietary suggestions are available at their website. The corporation supports the local communities of its chains by giving to schools, churches, and military organizations. In addition, Ryan’s offers Military Mondays, giving discounts on Mondays to military veterans, current members, and their families. It also has Family Night on Thursdays, with balloons, costumes, and a special price for kid’s meals. Corporate career opportunities are posted on the company’s website when openings are available. The business staffs people in the fields of Training, Tax, Security, Risk Management, Real Estate, Quality Assurance, Purchasing, Operations Services, Marketing, Legal, Information Services, Human Resources, Group Sales, Facilities, Culinary, Construction, Administration, and Accounting/Finance. You can apply online for a corporate position when there is an opening. Browsing Ryan’s jobs on the website will take you to the corporate site, where more than 1900 in-store positions are listed for all of Ovation Brands’ restaurants. You can narrow your search by entering the locations of the restaurants that interest you. Titles available are General Manager, Hospitality Manager, Kitchen Manager, Restaurant Manager, Shift Manager, Server, Line Cook/Prep Cook, Food Bar Attendant, Dishwasher, Cashier, and Baker. How old do you have to be to work at Ryan’s? You must be 16 to work at Ryan’s. The business has lots of entry-level positions available to high school students and other inexperienced workers, as well as more seasoned workers. Be sure to read the job description online for responsibilities and requirements before applying. Benefits of entry-level careers with this leader in the buffet industry include the chance to gain work experience in a fast-paced, friendly environment. Hours in the restaurants vary by location, and by day. One location’s hours are Monday 10:45 AM – 8:30 PM, Tuesday through Thursday 11:00 AM – 8:30 PM, Friday 10:45 AM – 9:00 PM, Saturday 7:30 AM – 9:00 PM, and Sunday 7:30 AM – 8:30 PM. Kitchen Manager – The Kitchen Manager oversees food preparation, making sure recipes are and safety rules are strictly followed. A high school diploma, a driver license, and availability to work long hours are required. Salary for this position can range from $30,000 to $60,000 commensurate with experience, and health insurance is an added benefit. Baker – As a Baker, you would mix ingredients for breads, muffins, and desserts, strictly following recipes and health codes. You must be 18. You must be able to lift, bend, stoop, stir, and tolerate a hot environment. You must be reliable. This position starts at minimum wage, but can go up with experience. Food Bar Attendant – The Food Bar Attendant stocks the food bars with food and utensils, and keeps the areas clean, while also assisting guests as needed. Excellent customer service and communication skills are requirements. This position is very physical, and requires a lot of standing and walking. Pay starts at minimum wage, but depends on experience. Cashier – As a Cashier you would greet every guest and ring in guest’s orders. You would take payments and answer phones. You would need six months of experience and have relevant math skills. A criminal background check is required. Pay for this entry-level position starts at minimum wage, but is commensurate with experience. Do you have any experience working in a restaurant? This business prefers to hire high school graduates with some experience, but they will give green people a chance, depending on the position. 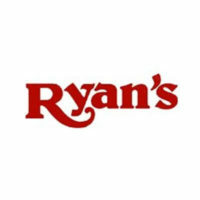 You can get a printable application for Ryan’s at the website by going through the application links below. If a customer complains about their food, what would you do? If you are hired, you will learn the company’s specific policy for a situation like this, but this question allows your interviewer the opportunity to see what your intuitive reaction would be. Be sure to ask what the company prefers after you give your response. Do you think you’d enjoy working around a lot of people? This question will help your interviewer decide if you are right for the employment position you selected when you were filling out applications. If you prefer to not interact with a lot of people, you may prefer the kitchen to the front of the restaurant. Are you in school? Don’t worry, if you are. The company hires many students. You would be expected to work evenings and week-ends. You can browse Ryan’s careers, see what locations are hiring, and get a direct application at the website. This business is a great place to enter the world of work. Would you like the chance to grow with our company? There are lots of job opportunities within the company for those who would like to stay for a long duration. This question is especially important if you are applying for a management position. Let your interviewer know that you respect their business. Several job descriptions specify that applicants must be reliable. Do not be late for your interview, and don’t forget any documents you might need. Take care that you are thorough when you fill out your Ryan’s application. You will not need your resume to apply for jobs at Ryan’s online. If you would like to know how to apply for Ryan’s online, go to the website through the links below. The website has an all-English or all-Spanish option for browsing its entry-level jobs. You can select restaurant crew, management, or corporate support areas to browse. You won’t be able to download application form, but you will have the option to get a printable application form. You can use the free application process available at the company’s website to apply for Ryan’s jobs online. The online application process will take you from a job description to a privacy agreement, and then on to an application form that you will have the option to print if you like.